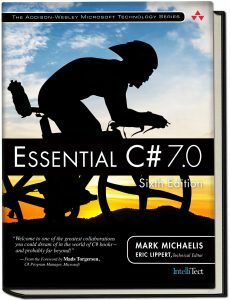 Essential C# 7.0 is a well-organized, no-fluff guide to C# 7.0 for programmers at all levels of experience. Reflecting C# 7.0 features and modern programming patterns, it will help you write code that’s simple, powerful, robust, secure, and maintainable. Author Mark Michaelis is a world-class C# expert: a long-time Microsoft MVP and Regional Director who also has served on Microsoft’s C# design review team. He presents a comprehensive tutorial and reference for the entire language, including expert coverage of key C# 7.0 enhancements, C# 7.0’s use with .NET Core/.NET Standard, and cross-platform compilation. He illustrates key C# 7.0 constructs with succinct examples, and presents best-practice coding guidelines. To help you maintain existing code, separate indexes provide version-specific answers for C# 4.0, 5.0, 6.0, and 7.0, and visual icons show when each language innovation was introduced. Includes C# 7.1, 7.2, and 7.3 language enhancements. Download the source code for Essential C# 7.0 here. View it in GitHub here.